We've combined Organic Orange essential oil and wildcrafted Gubinge with our antioxidant-rich Raw Dark Chocolate. Healthy and nourishing, it's a taste which is just divine. 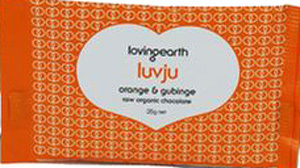 Our Orange & Gubinge Chocolate Luvju is made with raw cacao. This means our chocolate has up to twice as many antioxidants as conventional chocolate. We've also used organic evaporated coconut nectar (a natural, low GI sweetener) instead of cane sugar to create this delightful and unique chocolate bar. Our raw dark chocolate has a nice clean snap, a smooth texture and a beautifully complex flavour. The evaporated coconut nectar gives the flavour a wonderful depth with toffee citrusy notes, in addition to making the bar extremely healthy. Gubinge is the Nyul Nyul language name for the Kimberley version of the Kakadu Plum. It is wildharvested from the Dampier Peninsula just north of Broome and is the highest natural source of vitamin C on the planet. Bruno Dann (Winnawal) is bringing back to his community the ancestral traditional ways of taking care of the land and the Gubinge trees, which is helping restore the amazing bush in this region. We’ve used the first compostable metalised film that’s just come out in Europe to wrap our Luvju bars. It's laminated to a paper finish on the outside, so it’s actually 96% plant-based compostable material. The dispenser box is printed on recycled board with vegetable inks and includes a unique design incorporating a totem on the front to reflect the spirit of each flavour. With our Orange & Gubinge Chocolate Luvju we’ve got the echidna, symbolizing the Kimberleys and Australia, aswell as the immune protection which the ingredients bestow.